Sustainability Accelerator Network – Do sustainability tools work? How would we know? By Alan AtKisson. Versions of this article have also appeared on LinkedIn (Sustainability Professionals group) and GreenBiz.com, where Alan has a regular column, North Star. A few decades ago, the sustainability movement lacked tools, so I started making some. Assessments. Indicators. Workshops. Even sustainability songs: They were communication tools. The tools seemed to work — or at least, people seemed to like them. So I kept it up, and recruited friends and colleagues into the process of tool development. Eventually we packaged up our most universally applicable tools into a suite, Accelerator; and around 2002, I started teaching workshops on how to use these Accelerator tools. These tools have spread internationally, and today they are in regular application around the world. There is no way to prove that these tools actually work. In fact, there is no good way to prove that any sustainability tool works. There is no good way to prove that any sustainability tool works. My first tool, developed in the early 1990s, was called Amoeba. It helps people learn to be better change agents, and get more skillful about introducing ideas for sustainability into organizations. It includes a workshop and a planning model, and the workshop part includes a fun, short, role-playing game. If you’d told me that three decades later, people worldwide would still be using this tool and running the simulation in multiple languages, I wouldn’t have believed you. Next came the Sustainability Compass, which has helped communities, schools and other organizations to adopt, assess and report on sustainability. Several companies use it as their basic sustainability framework, on which they build reporting programs or communications initiatives. Finally, we developed the Pyramid workshop, which guides groups through systems-based, highly collaborative learning and planning processes for sustainability. The Pyramid workshop — which includes building an actual four-sided pyramid, instead of just using flip-charts and Post-It notes — has been run thousands of times around the world. This kind of widespread use (I wrote an earlier column about how universities are using the Accelerator, for example) always has led me to assume that these tools work. But then came that haunting question: How can we be sure? When has one of our tools made the crucial difference between something happening, or not happening? Becoming more sustainable, or not? To be honest, I can’t say. You can never re-run a project, minus the use of certain tools — while keeping everything else exactly the same — and see whether the results ends up better or worse. Has full-cost accounting, life-cycle assessment, materiality analysis or other sustainability tools and methods actually made the world more sustainable than it otherwise would’ve been? This critique (it’s more of an existential lament) can be leveled at any sustainability tool or method. If there were no sustainability reporting, would global business be more or less sustainable? Has full-cost accounting, life-cycle assessment, materiality analysis or a hundred other sustainability tools and methods actually made the world more sustainable than it otherwise would’ve been? Even if they have — and I do believe they have — how could we prove it? In the absence of proof, that might be the best we can hope for. We know, with some certainty, that the use of sustainability tools — whether they support training, planning, analysis, strategy or reporting — enriches the pool of information and experience (and relevant skills) available to decision makers and change agents. And we have a pretty solid basis for the belief that decisions get better when they are better informed. Ergo, sustainability tools should be helping us to make the world more sustainable. And yet, sometimes I still wonder. Do you? P.S. 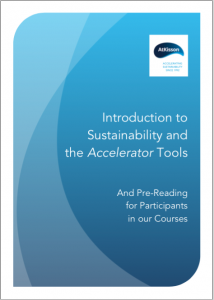 I’m teaching an online class about our Accelerator tools starting April 11 with the ISSP.